4 October 2018 – Thaipat Institute today releases the Thaipat ESG Index that constitutes of 58 outstanding stocks from its ESG100 universe, assessed by using integrated ESG (Environmental, Social and Governance) rating model that are likely to drive financial returns not less than the market rate. The Index is calculated by S&P Dow Jones and fed via Bloomberg and Reuters terminals to the investors globally. Thaipat Institute, by its ESG Rating unit, the pioneer in the development of Thailand’s corporate sustainability database and the annual ESG100 list; the 100 outstanding performers in terms of Environmental, Social and Governance (ESG) listed in Thai stock market (Both SET and mai) since 2015, has now released the “Thaipat ESG Index” as a “Benchmark Index”, and also serve as an “Investable Index” for a variety of financial products that have accorded importance to quality securities qualified by Thaipat’s ESG criteria, such as private funds, mutual funds, exchange-traded funds (ETF), or provident funds under asset management firms seeking for good returns from equity investing etc. The Thaipat ESG Index series consist of Price Return, Total Return, and Net Total Return indices. The Indices are calculated by S&P Dow Jones and fed via Bloomberg and Reuters terminals to the investors across the world. Dr.Pipat Yodprudtikan, chairman of Thaipat Institute, says, “The Thaipat ESG Index is Thailand’s first ESG Index that employed equal weighing scheme where each constituent in the index has the same weight in order to avoid concentrating too much into a few large stocks”. “By eliminating the market capitalization constraint that stocks with smaller market cap get lower weights in a market cap weighting scheme, the equal weighing gives more exposure to smaller cap stocks compared to cap weighting. This will give opportunities to small market cap stocks with good ESG taking effect in the index as well as the large market cap stocks,” he adds. According to MSCI research*, over the December 2000 to mid-2015 period, equal-weighted versions of MSCI flagship indexes, such as the MSCI USA Equal Weighted Index, delivered significantly higher returns than their cap weighted counterparts. The Thaipat ESG Index uses the first value date on 30 June 2015, which based on the first ESG100 list released in 2015, and the base value of the index is 100. There are total 58 stocks in the basket of Thaipat ESG Index. The list will be updated every year based on the annual assessment of ESG100 universe. The return rate of the Thaipat ESG Index TR (THAIESGT) from the base date till 28 September 2018 is at 10.07% per year, higher than the 6.08% return of the Dow Jones Sustainability Emerging Markets Index NTR (DJSEMUN). 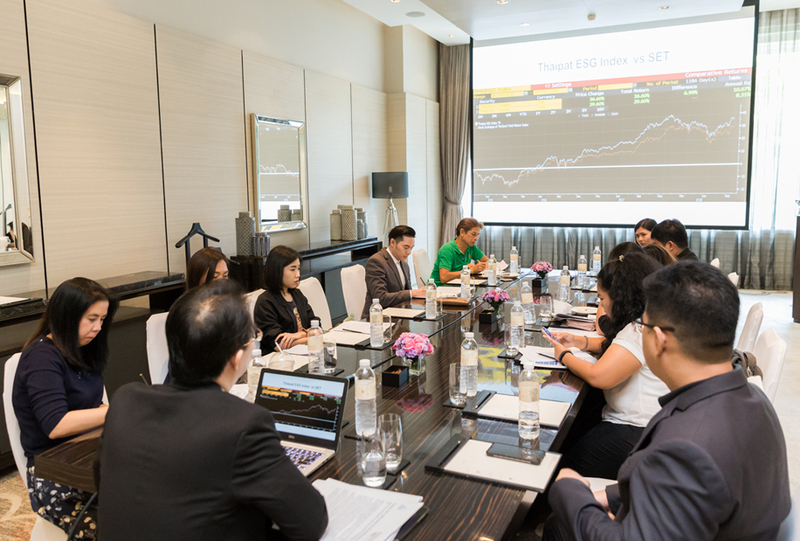 Investors can access the Thaipat ESG Index with Price Return, Total Return, and Net Total Return via Bloomberg and Reuters terminals.